CUDA-Z 0.9.230 SVN is out at 2014.09.23. CUDA-Z 0.9.220 SVN is out at 2014.06.18. New build environment is used for Mac OSX version. As far as ia32-libs package was removed from ubuntu repository there is a difficult situation appears. It’s hard to locate what exactly is missing between ubuntu libraries to make CUDA-Z run properly. CUDA-Z 0.8.207 is out at 2013.11.22. 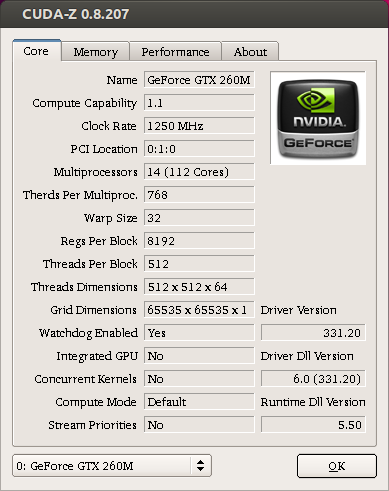 CUDA run-time 5.5 in use. Fix search of CUDA library in Linux (Bug: 16). Use static CUDART and UPX to reduce a package size.